The Applied Ballistics team tested six (6) same-length/same-contour Bartlein barrels to observe how twist rate might affect muzzle velocity. This unique, multi-barrel test is featured in the book Modern Advancements in Long Range Shooting. That book includes many other fascinating field tests, including a comprehensive chronograph comparison. When considering barrel twist rates, it’s a common belief that faster twist rates will reduce muzzle velocity. The thinking is that the faster twist rate will resist forward motion of the bullet and slow it down. There are anecdotal accounts of this, such as when someone replaces a barrel of one brand/twist with a different brand and twist and observes a different muzzle velocity. But how do you know the twist rate is what affected muzzle velocity and not the barrel finish, or bore/groove dimensions? Did you use the same chronograph to measure velocity from both barrels? Do you really trust your chronograph? Most shooters don’t have access to the equipment required to fully explore questions like this. 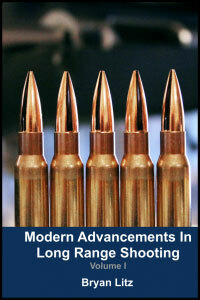 These are exactly the kinds of things we examine in the book Modern Advancements in Long Range Shooting. In that book, we present experiments conducted in the Applied Ballistics lab. Some of those experiments took on a “Myth Buster” tone as we sought to confirm (or deny) popular pre-conceptions. For example, here’s how we approached the question of barrel twist and muzzle velocity. We acquired six (6) barrels from the same manufacturer (Bartlein), all the same length and contour, and all chambered with the same reamer (SAAMI spec .308 Winchester). All these barrels were fitted to the same Savage Precision Target action, and fired from the same stock, and bench set-up. Common ammo was fired from all six barrels having different twist rates and rifling configurations. In this way, we’re truly able to compare what effect the actual twist rate has on muzzle velocity with a reasonable degree of confidence. Prior to live fire testing, we explored the theoretical basis of the project, doing the physics. In this case, an energy balance is presented which predicts how much velocity you should expect to lose for a bullet that’s got a little more rotational energy from the faster twist. In the case of the .30 caliber 175 grain bullets, the math predicts a loss of 1.25 fps per inch-unit of barrel twist (e.g. a 1:8″ twist is predicted to be 1.25 fps slower than a 1:9″ twist). 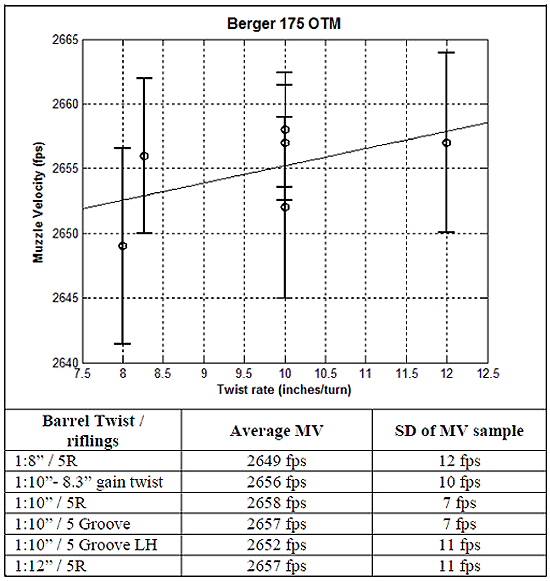 Above, data shows relationship between Twist Rate and Muzzle Velocity (MV) for various barrel twist rates and rifling types. From fast to slow, the three 1:10″ twist barrels are: 5R (canted land), 5 Groove, 5 Groove left-hand twist. We proceeded with the testing in all 6 barrels from 1:8” to 1:12”. After all the smoke cleared, we found that muzzle velocity correlates to twist rate at the rate of approximately 1.33 fps per inch of twist. In other words, your velocity is reduced by about 5 fps if you go from a 1:12” twist to a 1:8” twist. [Editor: That’s a surprising number — much less than most folks would predict.] In this case the math prediction was pretty close, and we have to remember that there’s always uncertainty in the live fire results. Uncertainty is always considered in terms of what conclusions the results can actually support with confidence. This is just a brief synopsis of a single test case. The coverage of twist rates in Modern Advancements in Long-Range Shooting is more detailed, with multiple live fire tests. Results are extrapolated for other calibers and bullet weights. Needless to say, the question of “how twist rate affects muzzle velocity” is fully answered. Share the post "Does Barrel Twist Rate Affect Muzzle Velocity? 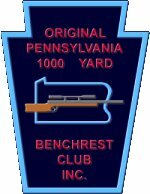 (Litz Test)"
The Original Pennsylvania 1000-Yard Club (Williamsport) is now accepting applications for its 2015 Long-Range Benchrest School. If you want to learn how to shoot accurately at very long range, one of the very best places to learn is the Williamsport 1000-Yard Benchrest School. The 8th Annual Benchrest School will be held Friday, June 5 through Sunday, June 7, 2015. Classes, taught by top 1K shooters, are held at the Williamsport Range, one of the best 1K ranges in the country. From June 5-7 2015, the club will host a multi-day, long-range Benchrest Academy for novice to intermediate shooters. For $350 students will enjoy 1 night and 2 days of intensive training under the guidance of top 1000-yard shooters. Prospective students will be taught all aspects of long-range benchrest shooting by highly skilled instructors. All areas are covered: load development, precision reloading, bench skills, and target analysis. Much time is spent at the loading bench and on the firing line. And you don’t even need guns and ammo — all equipment and ammunition will be provided. The sign-up deadline is June 1st. To reserve a spot, email School Director/President Ryan Miller: ryanmiller @ htva.net. On Friday night (June 5th), students will meet their mentors. Saturday (June 6th), the class moves to the range for a full day of hands-on technical training. Topics will include precision reloading, load development, gun handling, use of chronograph, analysis of shooting results, gun cleaning, and target analysis. The club will provide the rifles and all reloading components. Saturday’s training sessions are followed by a steak dinner which is included in the $350 seminar price. On Sunday (June 7th), after an early training session covering bench set-up and match strategies, students will participate in a 1000-yard match, spending time both behind the trigger and in the pits. Instructors will explain how to read conditions, and will demonstrate target measuring and analysis after the relays. The program wraps up by 4:00 pm on Sunday. To see what the 1K Benchrest school is like, watch the slide show/video below, produced by Sebastian Reist, an alumnus of the 2009 Williamsport 1000-yard BR school. Share the post "Williamsport Taking Applications for Long-Range BR School"